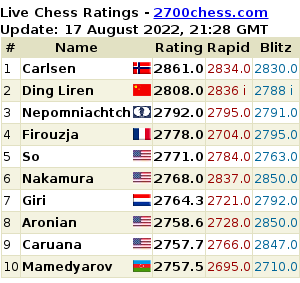 • The three highest-placed teams in the FIDE Olympiad prior to the event. • The four Continental Champions. The qualifiers will be the winners of the ultimate, respective Continental Championship organised at least six months prior to the Women’s World Team Championship. • A team from the organizing federation. • A team to be nominated by FIDE President and ranked in the official FIDE top sixteen countries list six months prior to the event. Further the following statement is made: "If any team would have already qualified according to one of these criteria, this place will be given to the next highest ranked country, in the Olympiad preceding the Women’s World Team Championship" which means one of the strongest teams of the world - Georgian women's team, is eliminated as long as it took only 8th place at the last Olympiad. Some other teams also won't take part in the championship although the average rating of their member players is higher than of the players of Turkish national team. The list of 64 qualifiers of the knock out tournament which will be held in Khanty-Mansiysk from November 10th-December 2nd has been published on the official website of the Women's World Chess Championship. Two FIDE nominees place were vacant. 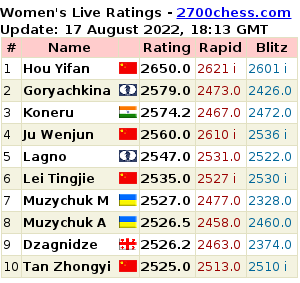 Russian Olga Girya and Guo Qi of China have been chosen by the FIDE President to participate in the competition. As Chess-News has found out Evgeny Sveshnikov was helping Viktorija Ni (the member of the US team) at the recent Women's World Team Championship which took place in Astana, Kazakhstan. Let us remind you exactly Ni has defeated Olga Girya in the match against Russia, therefore, bringing overall victory to the US team. "I have contributed to that," GM Sveshnikov said at the European Senior Championship which is currently underway in Plovdiv.